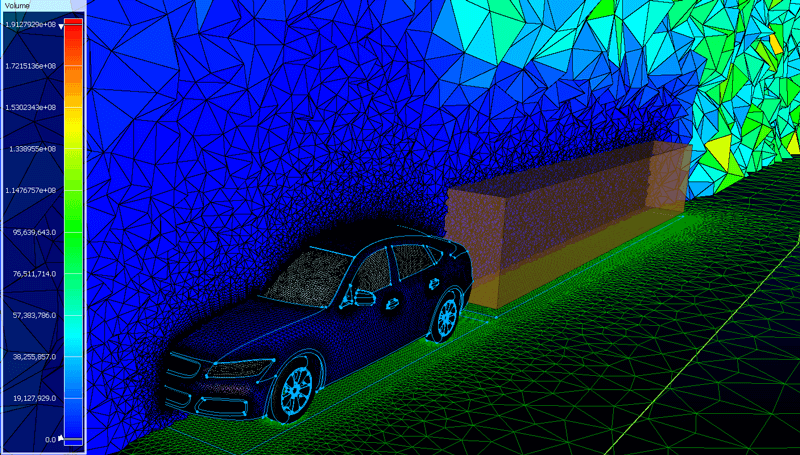 The new meshing capabilities coming in the next major release of the Pointwise software are perhaps the most significant and impactful since unstructured meshing was added in 1998. New algorithms provide the rapid generation of quad-dominant unstructured surface meshes. These surface meshes can be used as the basis of a T-Rex (anisotropic tetrahedral extrusion) hybrid volume mesh resulting in boundary layers resolved by layers of unstructured hexahedral cells. Off-body flow features can be resolved using new shape-driven clustering sources. And unlike Pointwise's current capability, each hybrid mesh can be maintained in the software in its hybrid form for mesh quality metric examination and any other function. A new quadrilateral -dominant meshing algorithm generates surface meshes consisting of mostly well aligned quadrilateral cells and does so with the same speed with which you are used to generating all triangular meshes. Figure 1 shows a simple, quad-dominant mesh for a golf club. 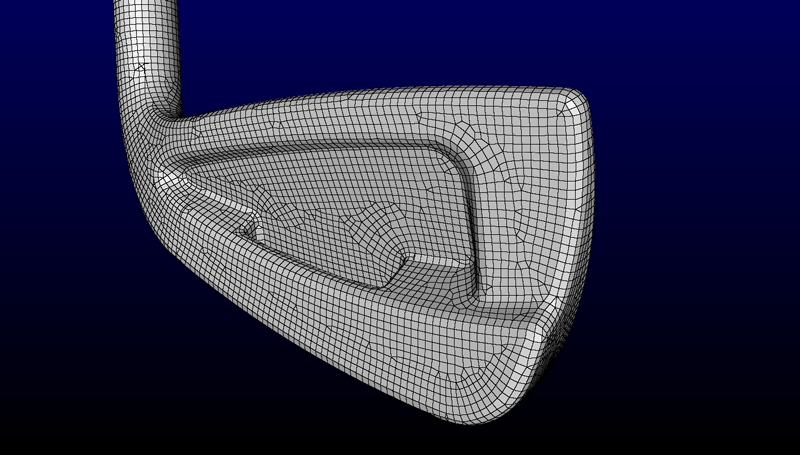 Figure 1: This quad-dominant mesh for a golf club was generated automatically using Pointwise's new meshing algorithm. An ONERA M6 wing was also meshed using the quad-dominant algorithm as can be seen in Figure 2. 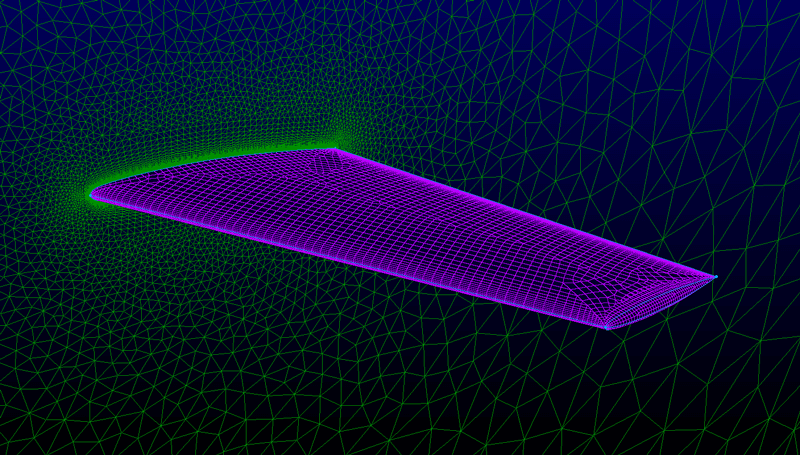 Figure 2: This quad-dominant mesh for the ONERA M6 wing was generated automatically using the new algorithms in Pointwise V18. The surface meshes in Figure 2 were then used as input to Pointwise’s T-Rex algorithm to generate fully hybrid meshes with layers of unstructured hexahedral cells in the near-wall region. Relative to prismatic/tetrahedral hybrid meshes, hexahedral/tetrahedral meshes have a lower cell count, improved convergence, and more accurate results (see In Pursuit of the Ideal Mesh on our Another Fine Mesh blog). Unlike T-Rex meshes in previous Pointwise releases, the full hybrid mesh is available for you to Examine in Pointwise V18 (see Figure 3) where the cells are colored by type (hexahedra, tetrahedra, etc.). Figure 3: This cut through a T-Rex mesh for the ONERA M6 wing shows grid cells colored by type (hexahedral cells are blue, prisms are green, pyramids are yellow, and tetrahedra are red). 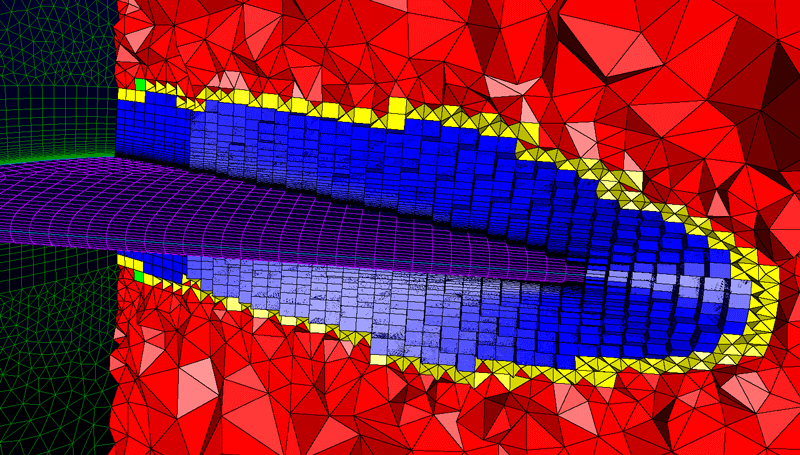 Local control over the cell sizes in a tetrahedral mesh away from the boundary layer regions are traditionally handled in Pointwise using a concept called baffles. A baffle is a piece of topology (for example, a surface mesh) that is embedded inside a volume mesh. The surface mesh of the baffle becomes part of the volume mesh such that small triangle cells on the baffle result in small tetrahedra in the volume mesh. In addition to baffles, Pointwise V18 now includes a much more flexible means of obtaining local mesh sizing control using sources. A source is a geometric entity (point, curve, surface, or volume) but is neither topological nor meshed. 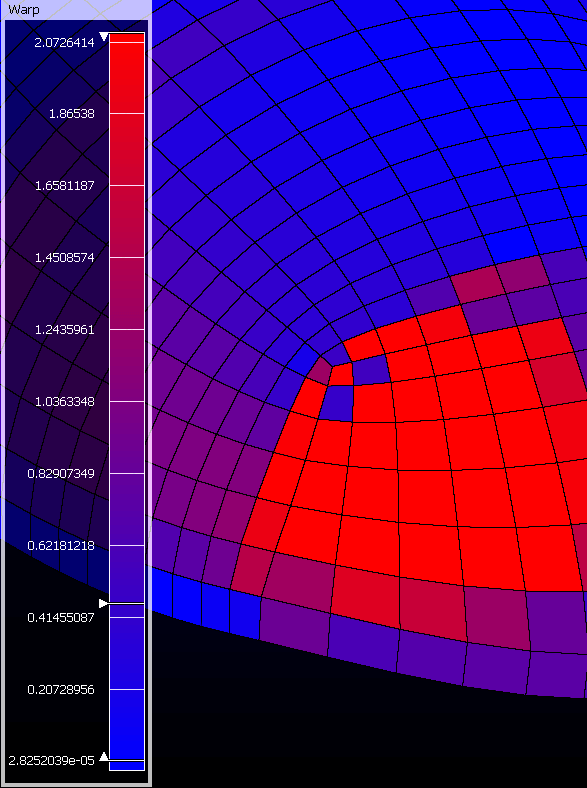 After defining the source's geometry, it is assigned a cell size and an optional cell size variation. The source influences the tetrahedral mesh size but does not constrain it precisely (compared to a baffle where points, edges, and faces become part of the tetrahedral mesh). Furthermore, a source need not be strictly contained within the interior of a block volume. An example is shown in Figure 4 where a box source behind the DrivAer vehicle is used to ensure clustering of cells in the wake region. For more details on sources, see the article Controlling Localized Element Size Gradation in an Unstructured Mesh in the Nov/Dec 2015 issue of The Connector. Figure 4: A box source (brown) placed behind the DrivAer vehicle ensures proper clustering in the wake region. Cells are colored by volume in a cut down the symmetry plane. To facilitate use of sources for local tetrahedral mesh sizing control, Pointwise V18 includes a new entity type called a shape. A shape is simply a geometric entity (polyhedron, cylinder, box, and sphere). The user interface for creating shapes (see Figure 5) uses a new sketching mode where handles on the shape (the green arrows) are used to adjust the size, position and orientation of the geometry. 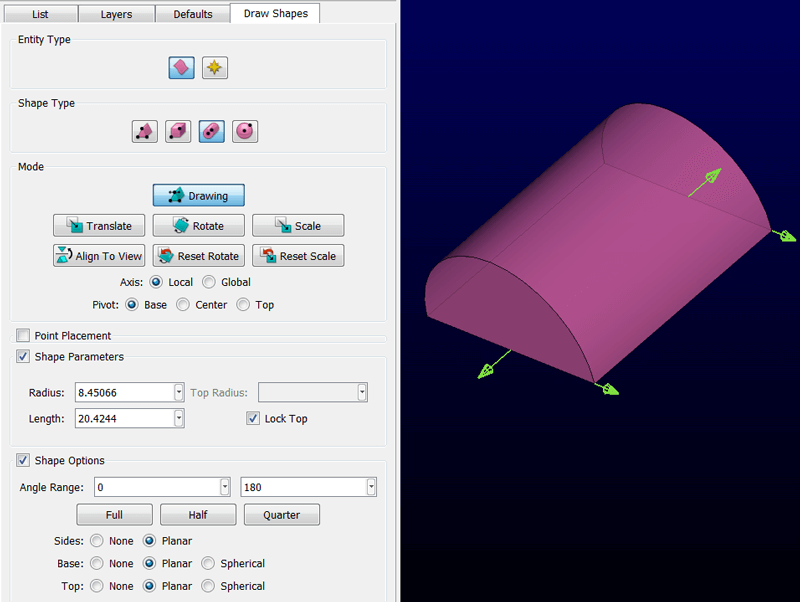 Figure 5: Creating simple shapes such as polyhedral, cylinders, boxes, and spheres for use as tetrahedral mesh sources is done with a new simple sketching interface. Pointwise V18 includes new capabilities that go beyond meshing algorithms and techniques. Several of the more interesting ones are described below. As you know, actions that result in new entities are announced in the Messages window (see Figure 6). These references to new or modified entities are now links (note the blue color and underlining) that select those entities when clicked. This is certain to be a handy tool. Figure 6: Entity references in the Messages window are now clickable links for selecting those entities. With Pointwise V18's expanded support for quadrilateral surface meshes (now both structured and unstructured), a metric for quad cell warpage became more important. The new Warp metric reports the difference in degrees of the two normal vectors that result from diagonalizing the quadrilateral cell (see Figure 7). Because a quadrilateral can be diagonalized in either of two directions, the maximum difference, or worst case is reported. Figure 7: You can now compute and visualize the degree of warp of quad cells in the Examine command. When it comes to understanding how and where your mesh is constrained to the geometry model, the expanded Database Associativity function in Examine now provides even more insight. You can display a table of point counts and percentages by whether points are on or off the database (geometry model). Another technique, shown in Figure 8, colors each point by the database entity to which it is attached, and individual entities can be turned on and off to make it easier to find outliers. Figure 8: The Examine command's Database Associativity function provides much more detail about how your grid is constrained to the geometry model. With the expanded cell-type support for meshes, it seemed perfectly reasonable to similarly upgrade Pointwise's support for faceted geometry as imported from STL and other files (also known as shells). During import you have the option (see Figure 9) to merge coplanar cells into polyhedral or set your desired mix of triangles and quads. This is in addition to the current feature that allows shells to be split along feature lines. The result can be a shell entity that is substantially less dense and therefore easier to work with as shown in Figure 10. Figure 9: In addition to splitting faceted geometry at feature lines, the shells can be simplified by joining those that are coplanar. Figure 10: By merging coplanar cells during faceted geometry import you can vastly reduce the size of your shell entities. The magenta shell on the left imported all the triangular facets directly. The cyan shell on the right shows the result of merging coplanar cells. There are a few changes in Pointwise V18 that deserve special mention. License management is being changed to the Reprise License Manager (www.reprisesoftware.com) for improvements ranging from installation, to license delivery, and ongoing license maintenance. The minimum operating system level for platform support has changed. Only 64-bit executables will be available for Pointwise V18 (32-bit versions are discontinued). 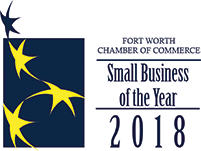 We would like to take this opportunity to thank our Pointwise Advisory Team, a select group of clients and partners, for spending time reviewing, commenting on, and guiding the implementation of features in Pointwise V18.